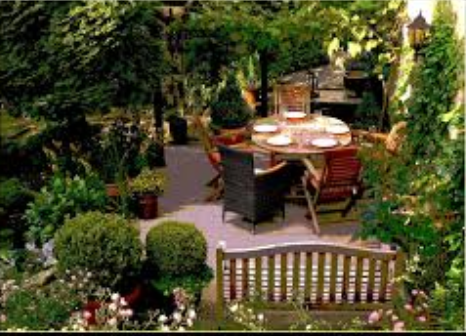 When spring rolls around and you start to get your garden furniture out, you may notice that it looks a little bit worn or dull. Exposure to the elements can leave your furniture looking dirty and dingy. Instead of buying new furniture to replace it, however, you may want to consider restoring it. It doesn’t take a lot of time or effort to make old, worn furniture look like new again. Best of all, restoring your furniture is a lot less expensive than replacing it. In this guide, you can find helpful information on cleaning and restoring a variety of different styles of outdoor furniture. From furniture that is made from metal to pieces that are made out of natural woods like teak, you can find all of the information that you need to breathe new life into your old furniture. Wood furniture is beautiful and durable. In fact, it can be left outdoors throughout the entire year. Keep in mind, however, that the more it is exposed to bad weather, the more weathered looking it will become. When spring rolls around, you can help your furniture look like new by giving it a good cleaning with a brush that has stiff bristles. If the wood itself has taken on somewhat of a silver color due to aging, you can return it to its original color with the use of a product such as Cuprinol’s Garden Furniture Restorer. All that you have to do is apply it to the surface, rub it in with a pad, and allow it to sit on the wood for a quarter of an hour. After the time is up, simply wash it away. Alternatively, you can skip the restorer and simply give your furniture a good cleaning. Using a combination of water and dish soap, gently scrub down your furniture, removing all traces of dirt and grime. When you are done, rinse any soapy residue away. After you are done cleaning it, you should take steps to protect it from the weather. Applying teak oil can help keep your furniture looking as beautiful as it was the day that you bought it. For the oil application, use a clean, soft cloth, making sure to apply the oil in the same direction as the grain of the wood. If you plan on adding more than one coat of oil, make sure the first coat is dry before you continue with the next. In terms of durability, plastic furniture really shines. Unfortunately, if it is kept outdoors too long, the color of the furniture can change. Because of that, most experts recommend storing plastic furniture pieces indoors in a shed or garage during the winter months. Avoid placing the furniture in an area where it will be in direct sunlight to prevent fading. Scrubbing down your furniture with a bit of warm water and a mild detergent will leave it looking fresh and clean after it is taken out of storage. With plastic furniture, a soft sponge is the best option since it won’t damage the surface. Make sure that all of the soap has been rinsed away before allowing the furniture to dry. Finish up by rubbing transparent car wax into the surface of the furniture to help it shine. Wrought iron furniture can be left outdoors throughout the entire year. Keep in mind, however, that it can rust. To help protect the metal, apply fresh paint that is specifically designed for wrought iron. Prior to painting the surface, use steel wool to clean away any existing rust. Make sure to thoroughly clean the surface before painting to avoid getting dirt in the paint. After the furniture has been thoroughly cleaned, you can apply paint to any rusted areas. If you don’t want to go through the hassle of cleaning away the rust before painting the furniture, you can look for special products like the Direct to Rust Metal Paint from Hammerite. Aluminum furniture is quite durable and can withstand exposure to the weather relatively well, meaning that you should be able to leave it outside year-round. The only thing that you need to watch for is oxidation of the metal. To minimize the chances of the metal oxidizing, consider storing the furniture indoors or using furniture covers to provide protection during the winter months. A cover with built-in UV protection can help keep the furniture from fading in the sun, as well. If the furniture is scuffed, you can use a pressure washer with warm and soapy water to remove the scuff marks, making sure to rinse it thoroughly using a garden hose. Finish off by applying a small amount of transparent car wax to the surface. If your furniture has any cushions or covers, make sure to remove them before winter. Use a dry brush to remove any dust from your furniture before washing it with a mild detergent. Make sure to rinse the pieces thoroughly before storing them. This will help remove any dirt, detergent residue, or other contaminants that were left behind after cleaning. Finally, pay attention to any fabric cushions, seat covers, umbrellas or art suggest Soothing Company. Typically, the best way to clean these items is with the help of a shampoo that is specifically designed for upholstery. Do this when it is warm outside so that the cushions have a chance to thoroughly dry. This will help minimize the risk of mildew developing. To get rid of dust, you can simply vacuum the cushions rather than shampooing them.